for those who just have started reading my blog, yes i am addicted to stars and stripes. see here, here, here, here and here. anyway, there´s this big fascination about america that i find really amusing. junk food, high school (football jockeys and cheerleaders), new york, ahh the list goes on. so when i saw this jacket from new yorker (that´s really the brand´s name, no pun intended), i just had to have it! i always wanted to be a cheerleader and never made it to the team (haha) so i´ll just dress up as one without the minions and the attitude! Hey I didnt get on the cheer leading squad as well haha! But I LOVE THE SHOES! Keep up the good work! Hey, pleats skirt and booties from hell! Fierce! What an amazing jacket. It's perfect for you! Such a rocker chic, patriotic look! such a cute jacket babe! Love love love your outfit!! You look great! You would be a great cheerleader, I bet. Just because you would be the best looking, best dressed one out there! :) I loveeee that jacket. And yep, typical american stereotypes. What can you do? you're just the perfect cheerleader !! congrats to your photograph too! 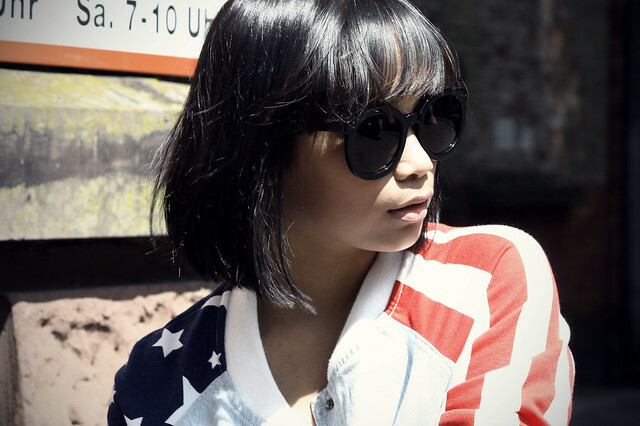 american flag on your jacket is amazing! I love this print! Give me the A give me the N, give me a J, give me en E, give me a L and I C A, ANJELICA!! I was a cheerleader without attitude ( I kid you not) ;) Loving the jacket and awesome post! 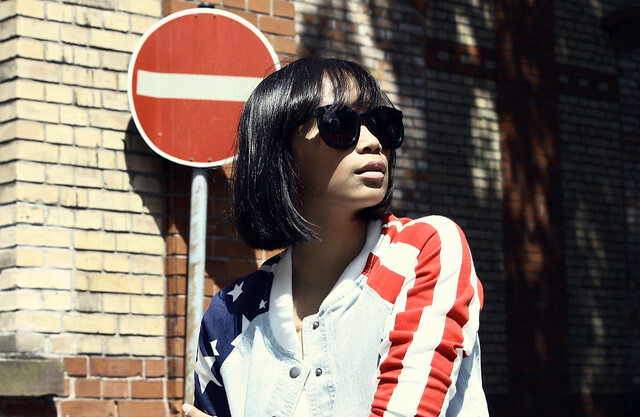 Your denim jacket with flag is cool ! Wie hast du das mit dem Facebook-button auf der rechten Seite hinbekommen?? Damn girl, you look freakin' fabulous! That skirt is everything...must hunt it down. it's from h&m! i saw it on sale in my local H&M about 3 weeks ago! ahhaha you need to live here in America!